I knew it would be perfect for my friend Norma, who I work with...she is crazy for hippos (yes I cut those Telus hippo ads out of magazines for her). 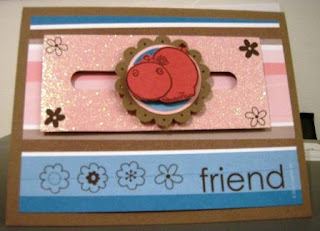 I also love spinner cards...they are so fun, and a spinning hippo...I hope this makes her smile. Well done spinner card, it is so so cute, she will love it. TFS.